Papa was a rocker. The Khmer king Yasovarman had built some of the most stunning monuments Cambodians had seen so far, founded the city of Angkor, and cemented thought patterns that lasted throughout Khmer history. His two sons who then became kings inherited a great legacy, but they were saddled with a tough act to follow. Little is known about both, but neither seems to have had the resources to compete with Yasovarman’s grandeur–or maybe they were more comfortable to bask in their father’s achievements and enjoy a luxurious life without working as hard as he did. Either way, both presided over the building of unique monuments that are almost as rewarding to explore as Yasovarman’s. They’re in the middle of Angkor, and thus easy to get to once you’re there. 1. It consists of a row of five towers on a base that’s about 150 feet long. 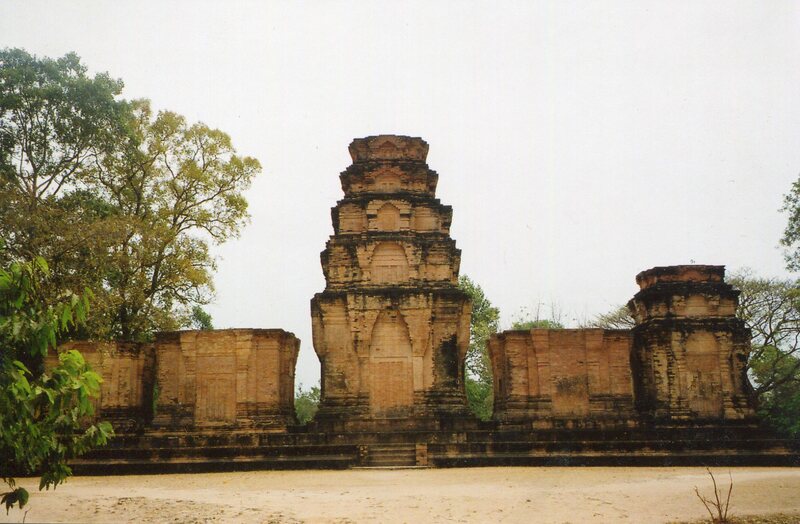 Preah Ko previously integrated three rows of six towers on one platform. Prasat Kravan’s design was simpler, less cluttered and more stately. 2. A reservoir once surrounded Prasat Kravan. Like Lolei it must have sparkled like a diamond among the lustrous water. So the builders used earlier ideas in this temple, but they added to them to make Prasat Kravan their own statement. 3. They made this temple symmetrical, as the Bakheng is, but it’s not huge. Its regularity doesn’t project overwhelming power. It’s elegant and intimate. The sizes of the five towers complement each other. The central shrine’s five levels (pictured above) mirror the number of buildings, and the levels recede in pleasant proportions. They’re also clearly defined from each other. 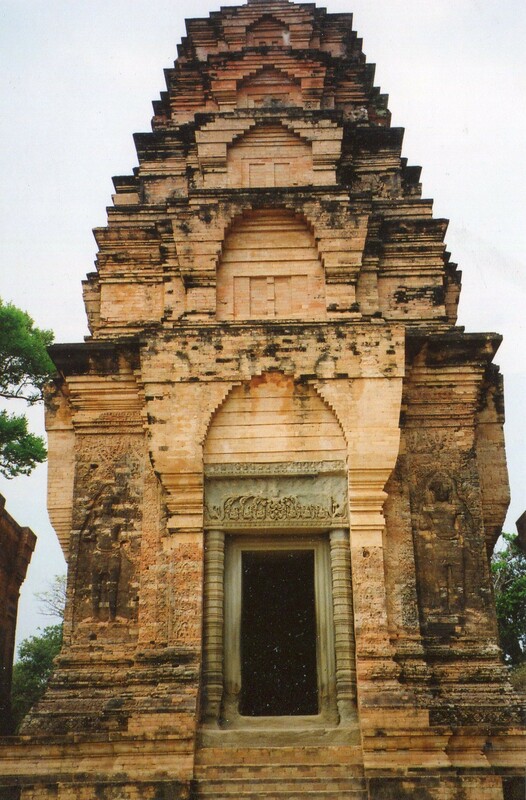 Prasat Kravan is as close as you can come to the aesthetics of ancient Greek temples at Angkor. Dad built huge monuments; the son and his officials enjoyed elegance, and came up with new ways to express it. 4. Prasat Kravan was dedicated to Vishnu, rather than Shiva, and it has exquisite reliefs of him and related deities in some of the towers. So though Harshavarman didn’t attempt to outdo his father, he and his men varied some of his ideas and put them in a temple that shows soft sides of Khmer temple architecture. The son and friends added to the stock of art forms that this prolific civilization would build later monuments like Angkor Wat from.